I know I already blogged about this. And as amazing as Julia Child’s original recipe is, I thought you might like to know how I’ve started to adapt this recipe to something I feel a little better about feeding my family. I’m sure there will be more changes as I continue to experiment. But this was what I did our first time out. Next time, maybe I’ll switch up the sugar with Xylitol. Or honey. Or Coconut Palm Sugar. If I do, I’ll be sure to let you know. Line your tart pan with the pie dough, put it in the freezer while you do the apple prep. Quarter, core, and peel the apples. Cut 3 of the honey crisp and 1 of the green apples into 1/8-inch lengthwise slices (for the top of the tart). Toss them in a bowl with 1 Tbls of the lemon juice and 1 Tbls of sugar. Reserve them for the top of the tart. Cut the rest of the apples into chunks. It should make about 8 cups of chopped apples. Place in a large saucepan and cook over a low heat for about 20 minutes. Squeeze the rest of the juice from your lemon into the apples. Stir occasionally. Spread the saucy mixture in the very cold pastry shell. Cover with a neat, closely overlapping layer of sliced apples arranged in concentric circles. 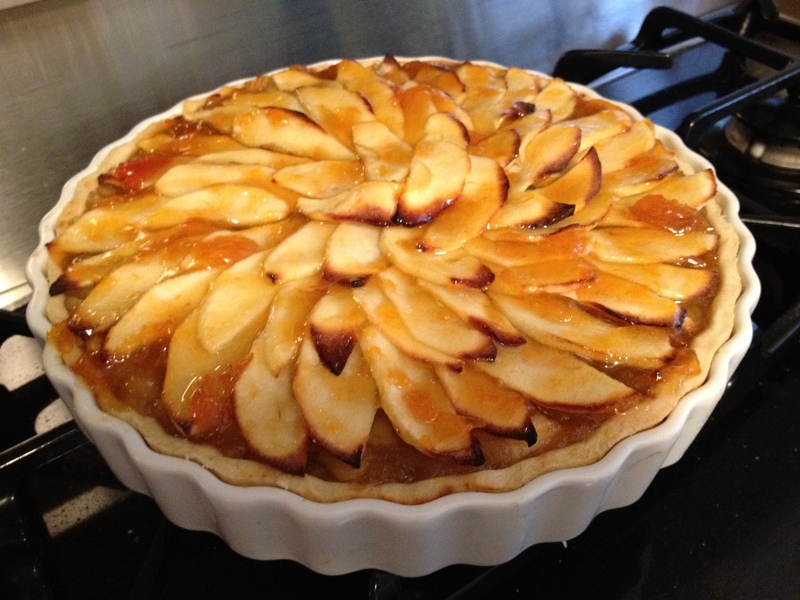 Bake in upper third of preheated oven for about 30 minutes, or until the apples have browned lightly and are tender. Carefully brush a light coating of apricot glaze over the tart. Serve warm or cold. Apply the glaze while it is still warm. Don’t feel obligated to use all of the glaze. Just use enough to make your tart glisten. You can just return the unused portion to the jelly jar and store in your fridge. A gently adapted version of Julia’s masterpiece. I know it’s not a major shift. But a little less sugar. Even without all the sugar, it’s still sweet. A few “better” ingredients. And the added lemon makes the filling a bit brighter. And having a cold pie shell makes the crust flakey and avoids the soggy thing that happens with pre-cooked shells that are filled with fruit compotes. A favorite in our house since I have an apple orchard. You did a lovely job.